New Delhi: With their fists up in the air, the women sang in solidarity. Soon after they arrived by road and trains, they hung banners up on the walls—one that said “Enough is enough" across a bright red cloth. Sushila Barala from Rajasthan wore a red dot on her forehead to mark her protest—a rejection of a traditional custom that expects a Hindu widow to dress down after her husband’s death. Binny, a tiny woman with a penchant for poetic speeches, held a microphone in hand. The lady from Jharkhand prefers to be known only by her first name. “Who says we can’t make a dent in the sky?" Binny sang out a popular Hindi couplet as her high-pitched voice fills the room. “All we need to do is throw a stone with all our strength." Modern feminists who celebrate singlehood and individuality as the ultimate sign of female power may at first be puzzled to see this gathering of the Rashtriya Ekal Nari Adhikar Manch, or the national forum for single women’s rights, for they’ve chosen to take an entirely contrasting path of revolution from theirs, for they intone each other to reject customs that don’t buy them food or freedom. They lobby with the government to raise widow pension rates. But they also counsel cruel in-laws, and offer, on demand, patching-up assistance to discordant couples. In its own unique struggle for emancipation, these women link their arms and stick together in times of distress, and the reasons for this are multiple and complex, according to Ginny Shrivastava, one of the movement’s original mentors. Most of them belong to poor families, without any power to resist harassment in a deeply male-centric, conservative society. While the tragic plight of widows is documented in books and films, there’s a huge invisible force that needs help—victims of domestic rage, the vulnerable who fall prey to sexual exploitation, the unmarried who toil away at homes without savings. And the numbers are staggering. There are at least 36 million single women—widows form the majority—in India, according to the 2001 census. (The recent provisional census survey hasn’t provided data for single women). “And most of them know exactly what it’s like to feel socially and economically down," Shrivastava said. A Canadian-born social worker, Shrivastava began mobilizing single women in her adopted home in Udaipur, Rajasthan, a decade ago. She played a key role in forming the country’s first collective—the Association of Strong Women Alone—to assist women without paper trails of marriage and divorce registrations in seeking alimony. She also worked on building their confidence to seek legal help in case of property disputes. Researchers and social activists say at the heart of India’s gender debate is whether the nation can walk down the growth path without reserving equity to its women, who constitute half of the nation’s 1.2 billion population. All women—not just single women—face different degrees of social and economic discrimination which they term as a “crisis" in a country experiencing a roller-coaster development drive. But they also point out contradictions. The vast swathe of single women in India—widows—is a social anomaly, a consequence of compulsory marriage that still salutes to clan and caste affinities. Single women, as we know them—urban careerists who choose to marry out of choice than pressure—are still a thin force. Most toil in underpaid or no-pay work, with little scope for economic independence. A recent paper by Indrani Mazumdar and Neetha S., researchers at the Centre for Women’s Development Studies, showed that the proportion of unpaid workers accounted for 75% of rural self-employed women between 1993 and 2004, reducing only marginally in subsequent years. 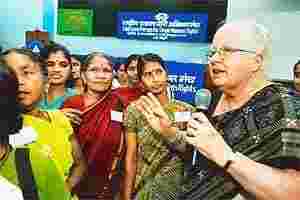 The problem of low earning capacities can only be fixed with greater political freedom, insists Annie Raja, general secretary of the National Federation of Indian Women (NFIW), the women’s wing of the Communist Party of India. The real issue is not whether lawmakers in Parliament would give 33% seats to women, says Raja, but whether they would vacate them for women. “This is going to be the longest, toughest fight against patriarchy," she said. NFIW, which first raised the slogan of women’s right to work in 1954, too, has been championing multiple causes, and not just for those who’ve been caught on the wrong side of marriage. Along with other grass roots groups, it had pushed for—and won—33% reservation of workdays for women under the Mahatma Gandhi National Rural Employment Guarantee Act, because women are the ones left behind to run households when menfolk migrate for jobs. In the winter of 2005, before the Act was passed, NFIW collected more than 100,000 signatures on saris and dhotis from villages all around, and brought them down to New Delhi’s protest ground, Jantar Mantar, unfurling the signed yards on trees along Parliament Street. Members of the Rashtriya Ekal Nari Adhikar Manch—now more than 80,000 of them—too, have been voicing for access to government benefits for many years. Spread across eight states with their own independent wings, they also picks issues as disparate as the women themselves. Nirmal Chandel from Himachal Pradesh cast light on the missing husbands in her mountain state, men who disappeared after heading to the cities, leaving their wives in a state of limbo, who can’t remarry and don’t have an income source. State membership: 8,920. Chaggi Bai of Rajasthan has been fighting for land rights ever since 50-odd women marched with her to win back a piece of farmland from her ex-husband’s family. State membership: 37,000. Evangelista Kadulna confronts a complex societal challenge out of step with modern India: rescuing women accused of possessing witch power in Jharkhand. State membership: 13,000. Then, there are those who are drawn by violence and natural disaster. Puspa Khangenbam’s husband died under a spray of army bullets in strife-torn Manipur. Sharifa Cheepa faced sexual violence during the 2002 Gujarat communal riots. Hansa Rathore is one among 1,157 women who lost their soul-mates during the 2001 Bhuj earthquake. “There’s a huge social pressure and perception that a woman is less complete if she lives alone," according to Advaita Kala, author of Almost Single, a teen bestseller. “As if getting into marriage, becoming a wife and having a child is the only right passage." Advaita, who’s in her 30s and lives blissfully alone, had recently finished writing a women-centric story for a Bollywood movie. She said though the film industry is supposed to validate popular culture, it has been slow in accepting the “single experience" and few actors openly talk about it. Down the pecking order, rural women with low literacy and fewer opportunities have little else to bank on but dialogues as they search their own route of survival. The forum members inform each other about social security benefits and push for reforms, as in Gujarat, to reinstate withdrawn pensions for widows. They educate each other about the meaning of the government’s garibi ki rekha (the poverty line) and extend help to access food ration cards. Some demands translate into action. Jharkhand has agreed to include single woman as a separate category in its women’s policy. In Rajasthan, the pension of widows has been raised, from ₹ 125 to ₹ 400 a month. The forum also encourages its members to boost their skills and schooling. And Ladli Dhakkar could well be their poster girl. Married off before she could speak, at the age of two, Dhakkar became a widow at 21. Her husband, with whom she had two daughters, remarried because she limped when she walked. After her husband died, the family threw her out of the house and she had to take refuge in her reluctant parents’ home. In 2008, however, Dhakkar, who’s now 43, successfully completed her 12th grade along with her 18-year-old daughter. “I felt shy to sit for an exam with my grown-up daughter, but then I asked myself what had I to lose?" said Dhakkar, who now works at an anganwadi school in her village of Sinhala in Rajasthan. Ultimately, freedom is about taking small steps to overcome obstacles in its distinct path of activism. “I tell the girls to stop feeling sad. I tell them to take out their colourful saris, mehendis and bindis," says Dhakkar.